Team High Road professional Roger Hammond held off a superb challenge from the un-gridded Liam Killeen (Specialized Factory Racing) to score his eighth national cyclo-cross championship win at Sutton Park, Birmingham, on Sunday. Hammond rode a strong and controlled race, but had to hold off the challenge of several would-be victors before clinching the win by one second in a sprint finish from Killeen. Hargroves Cycles ace Stuart Bowers had led in the early stages, but Hammond was never far behind along with Jody Crawforth (Evans Cycles), Paul Oldham (Hope Factory Racing) and Danny Booth (Pedal Power). Killeen was struggling through the mass of riders on the opening lap and was not in the top eight as they crossed the line at the end of the first 2.9-kilometre laps, but by lap three he was fifth and closing. At the end of the third lap Hammond led by six seconds from Booth and Oldham, while Killeen was just off their wheels. But by the start of lap seven Killeen hit the front with Hammond, and tried to shake off his rival as they headed for the final circuit. But Hammond hung on, and mid-way through the last lap he attacked, holding the lead to the final corner and clinging on to take the win. Earlier in the day Helen Wyman (Swift Racing) had beaten team-mate Gabby Day to win the women?s title by 1-20, while VC Deal?s Alex Paton won the junior title by just ten seconds from Andrew Williams (Cwmcarm Paragon RC). 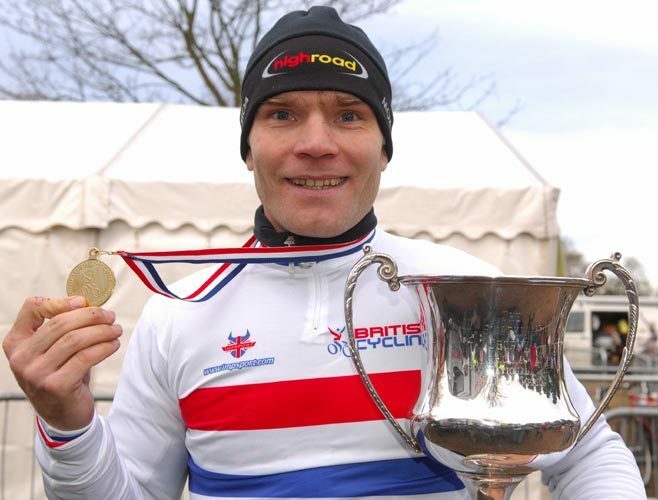 The previous day, Midlands ace Steve Knight (MI Racing) had lifted the veterans 40-49 crown ahead of team-mate Geoff Giddings, who had to settle for second spot for the second year running, while defending champion Chris Young (Team JD Cycles) was relegated to third spot, just ahead of Yorkshire rival Noel Clough (Fietsen Tempo). Defending champion Roy Hunt (Kinesis UK) once again proved strongest in the over-50s race, beating Peter Harris (Pearce Cycles) into second, while Team Milton Keynes? Peter Smith completed that podium. After finishing almost a minute behind his rival in the last round of the National Trophy, Ian Bibby (Science in Sport-Trek) improved considerably to win the under-23s title ahead of Ian Field (Hargroves Cycles), while David Fletcher (Science in Sport-Trek) was third. And in the youth race, Luke Gray (Hargroves Cycles) pipped Sam Harrison (Cwmcarn Paragon RC) to the line, while Keighley youngster Tom Moses (SSC Cyclesport) was third. Ruby Miller (Maindy Flyers YCC) was best girl, while Samuel Lowe (Merlin Racing Team) was best of the under-14s. See this week?s Cycling Weekly for much more on the National Cyclo-Cross Championship. Girls.- Ruby Miller (Maindy Flyers YCC). Under-14s.- Samuel Lowe (Merlin RT).